If You're Limiting Your Search to the Rocky Mountains Region, Which Schools are Most Focused on Agricultural Production? 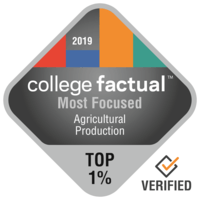 University of Wyoming is among your top options if you're planning on studying Agricultural Production. Students who enjoy a more slow-paced life will appreciate University of Wyoming's location in the small town of Laramie, Wyoming. Around 98.1% of the professors at University of Wyoming are full-time and get normal office hours, so they should be more accessible to help. Every year, around 70.0% first years get a scholarship, with the average amount being $5,359. Want to learn a little more about University of Wyoming's campus? Have a virtual tour. Every student who is interested in Agricultural Production needs to take a look at Southern Utah University. Students who like a more relaxed life will treasure the school's position in the little town of Cedar City, Utah. Southern Utah University's fair yearly price is pretty irresistible to students who need to avoid too much debt. Don't be concerned about affording Southern Utah University; 60.0% of their students get some form of financial aid. In what areas is Southern Utah University doing the best? Look into all the school rankings. It's hard to find a better school than Utah State University if you want to pursue Agricultural Production as a major. Positioned in Logan, Utah, this university is ideal for students who thrive in an urban atmosphere. Due to its commitment to superior academic standards and its yearly net price of $15,116, Utah State University is a great value for your money. Just 5.3% of Utah State University graduates have defaulted on their loans. That is notable, when the average is 7.0%. A virtual tour could be a good way to explore Utah State University. Brigham Young University - Idaho is a good option for students pursuing an Agricultural Production degree. With more than 20,000 students, this institution is one of the largest schools in the nation. If on-campus safety is one of your priorities, you'll be glad to know that this school has a low crime rate. Concerned that you won't be able to afford Brigham Young University - Idaho? Don’t let that stop you from applying because 53.0% of students receive financial help. Check out all of Brigham Young University - Idaho's rankings to find out more.